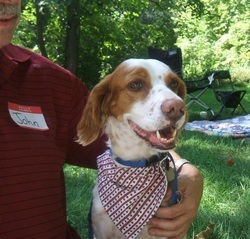 I went to the American Brittany Rescue 7th Annual National Picnic Sept. 11 in Earlville, Ill. I met many wonderful people who love Brittanies. I was in tears with many of the dogs, they reminded me so much of my Speckles. It was like hugging angels. 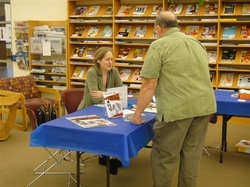 I handed out information about my coming book because a portion of the proceeds is being donated to ABR. I was honored to meet Bill McFarlin and Star – Bill and his Brittany, Star, were stars on CBS’s Greatest American Dog show. Bill and Star were not the final winners of the show, but they placed very well and were a huge hit. I remember seeing two episodes of the show and crying when I saw Star. She reminded me so much of Speckles. 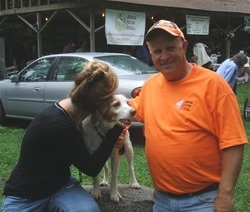 This was the second year that Bill and Star, and Bill’s wife, Sherrie, have come to the ABR annual picnic. They drive here from Texas in a car that has special decals on it for Star – including her picture. They have endorsements from different companies and travel to approximately 250 appearances nationwide each year to talk about dog training and agility and such. Of course, Star performs. Their Web site is www.billandstar.com if you’d like to read more about them. 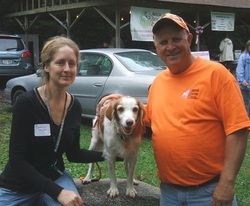 Images from the 8th annual American Brittany Rescue - Illinois picnic held Sept. 10 in Earlville, Illinois. 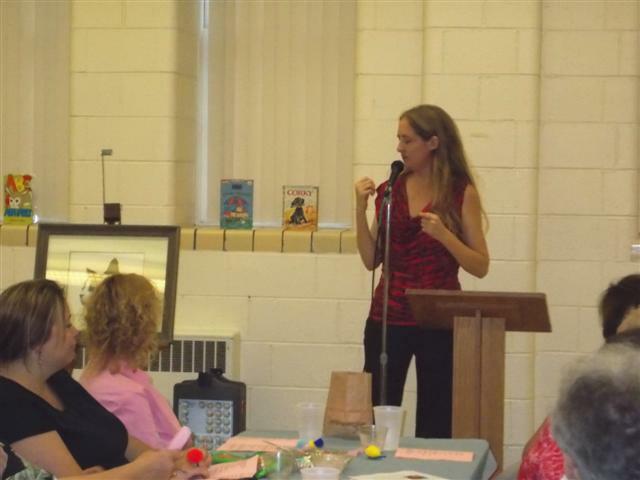 I shared information about my book. It was heartwarming to hug and kiss so many Brittanies. www.iwpa.org See the Fall 2011 PenPoints Newsletter, page 5. 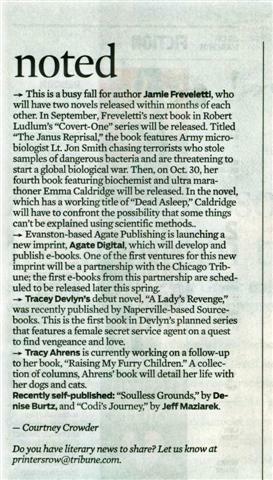 Read an Oct. 9, 2011 review in the Danville, Illinois Commercial-News. 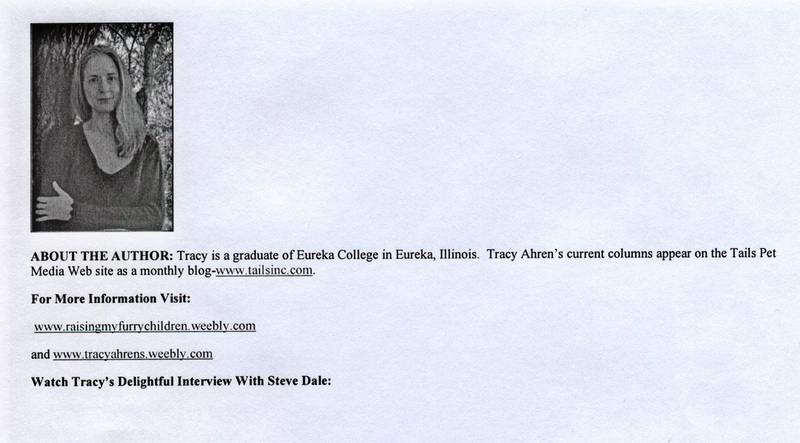 Listen to an interview with Tracy Ahrens on WKAN 1320 AM radio, Kankakee, Illinois and surrounding areas. 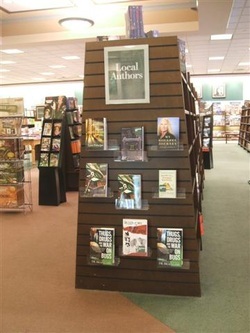 Barnes & Noble in Bourbonnais, Illinois (bottom, center). Sorry - due to changes at the radio station (2013), the recorded broadcast is no longer available. Written by Steven Fletcher. Blog post no longer available. October 10, 2011 publication story. 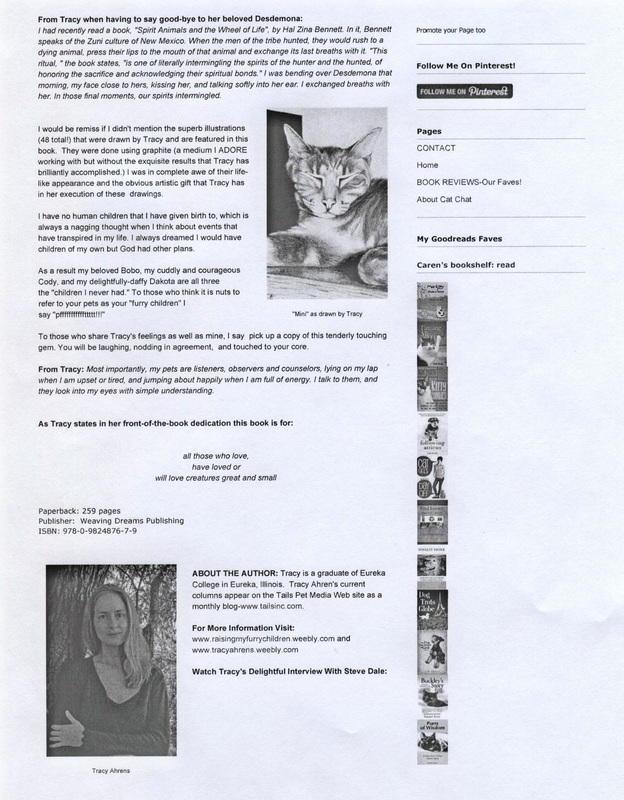 A copy of "Raising My Furry Children" is in the lobby for clients to read and "Raising My Furry Children"
Cat Fancy, January 2012 book note. This is "the world's most widely read cat magazine." Video of a radio interview with Steve Dale! Enjoying some time with Hazel, Steve Dale's dog, during my interview with him. Hazel sat on my lap for some of the interview time! What a honey. Steve Dale mentions "Raising My Furry Children" on ChicagoNow. Animal Radio rates "Raising My Furry Children" "4 out of 5 paws" in their Book Club Reviews section! or read the review below along with reader comments. Download a page to open it to a readable size. "Raising My Furry Children" on her blog site. Click here Dakota's Den or read the review below. 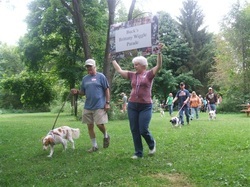 "Raising My Furry Children" is noted in the spring 2012 issue of The American Dog Magazine. in the spring, summer, fall and winter. It is a "lifestyle" dog magazine that is devoted to showcasing the extraordinary lifestyles of dogs and the rewards associated when a family embraces these canine kids as a member of the family. The American Dog Magazine has a circulation of 800,000.
available in their archives (2013). 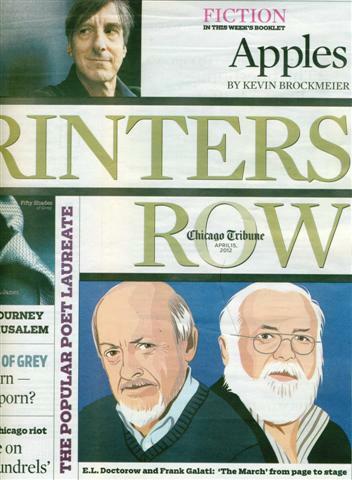 Printers Row on April 15, 2012. 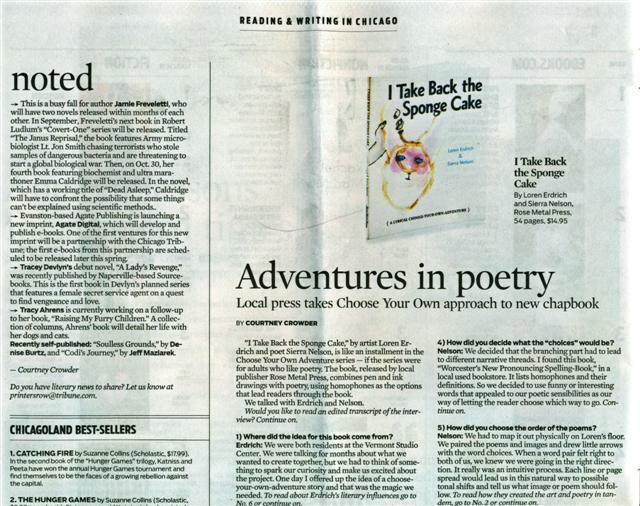 "Reading & Writing in Chicago" page. 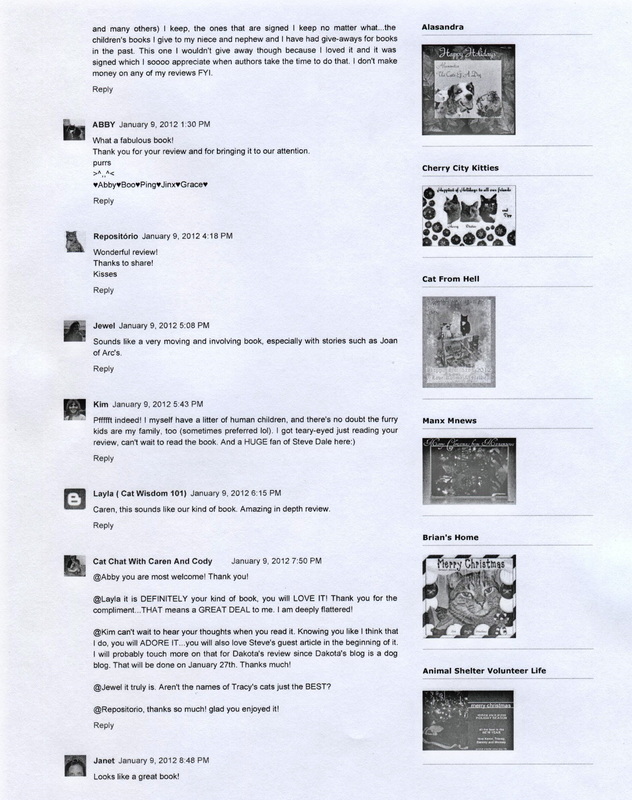 On May 12, 2012, pet blogger and freelance writer, Caren Gittleman showcased a story about my mom, Linda Ahrens, and her project of making quilts for cats and small dogs. Proceeds go to charities for animals. The post is called "Mother's Day Weekend Salute: Linda Ahrens And Her 'Quilts For Cats' Raise Money For Animals In Need." Caren mentions "Raising My Furry Children" in this story! 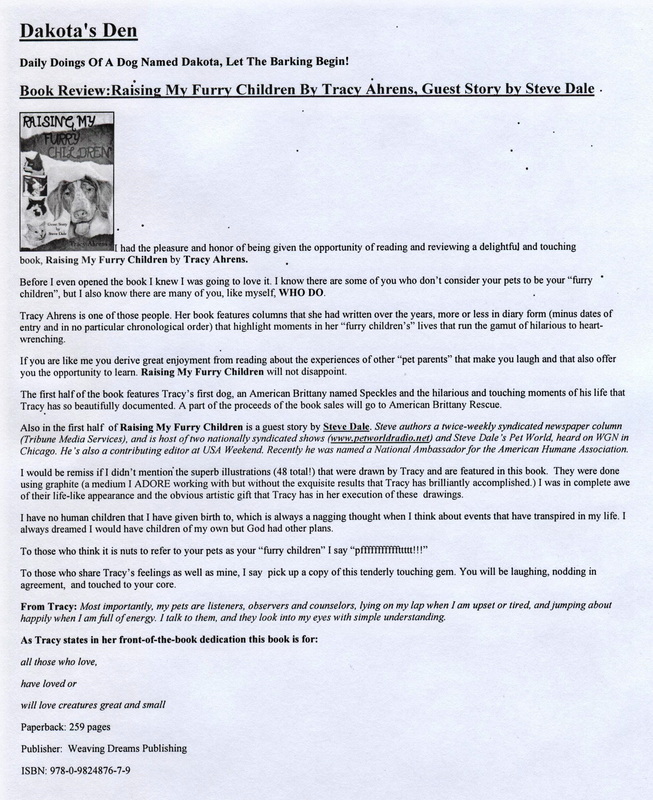 During 2012 Sears.com listed "Raising My Furry Children" as a book to buy! Youtube features an interview by Steve Dale with Tracy Ahrens about "Raising My Furry Children." OrganizedWisdom helps people discover great links, shared by over 5,000 doctors, health experts, and advocates, and is organized by specific health or healthy-living topics such as "Pets." 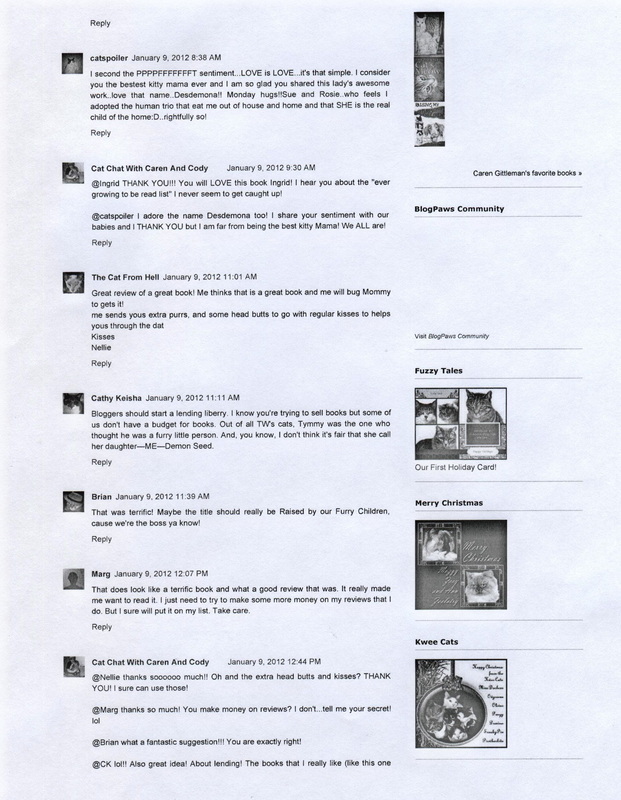 Among the Pet listings is the interview between Steve Dale and Tracy Ahrens about "Raising My Furry Children." weekly cat news roundup. 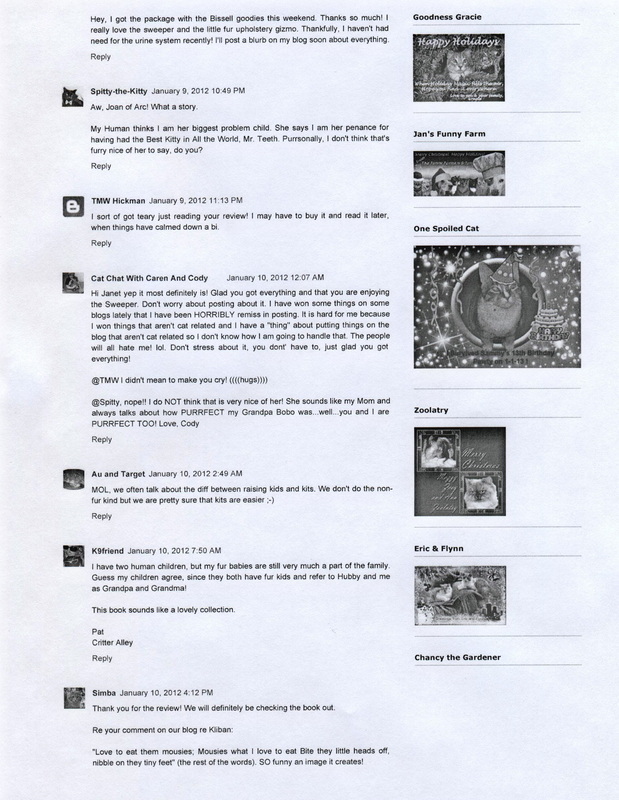 He mentions "Raising My Furry Children" (Dec. 16, 2011). 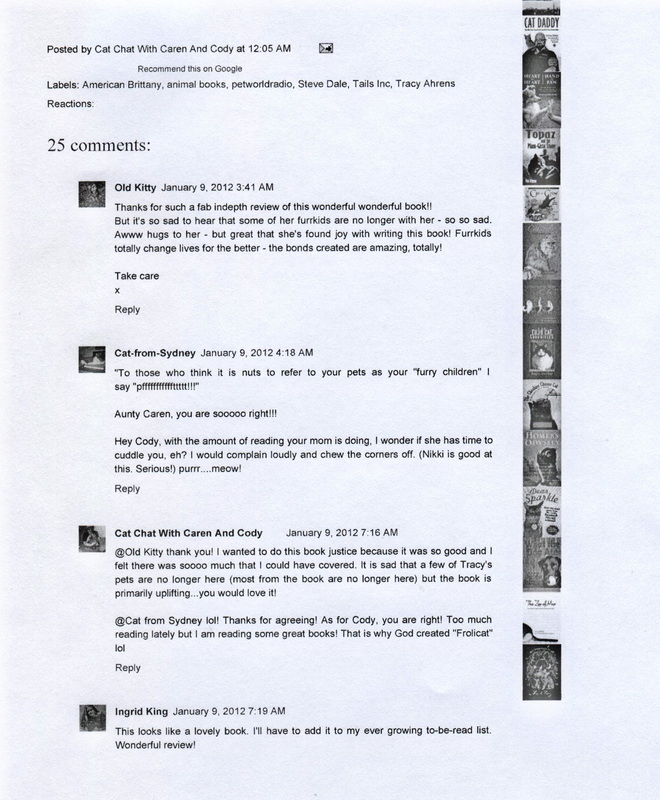 A website called The Year of the Cats mentions "Raising My Furry Children" in a reader comment! dog trainers, reaching audiences in over 50 countries, her website says. She is best known for her role as the star of Animal Planet's TV series "It's Me or the Dog." She also served as a judge on CBS's "Greatest American Dog." DogTime.com and CatTime.com offers 120,000+ pages of content about pet information between them. The DogTime.com community includes over 565 pet bloggers and 525 pet publishers. This gives DogTime Media a reach of over 46 million monthly. Bloggers.com is a social network for blog writers. using my gifts of writing, drawing and more. 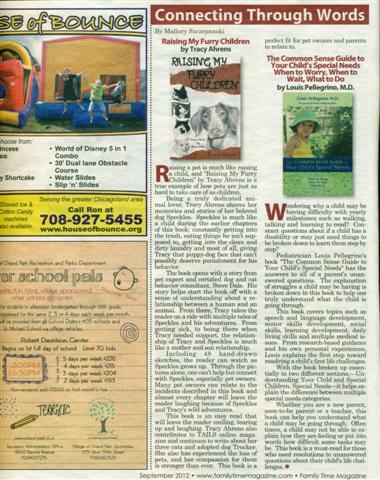 including "Raising My Furry Children,"
were featured in KVMag's August 2012 edition. Animals Writes on Pet Life Radio! In August 2012 Tracy Ahrens joined Tim Link on Pet Life Radio to talk about "Raising My Furry Children." Tim asked Tracy what inspired her to write about her many "furry children," what she hopes readers will take away from reading her book and how long she’s been writing about animals. Tim also asked Tracy about the illustrations of her animals that are featured in her book (that she created) and what having so many animals in her life over the years has meant to her. Pet Life Radio is a pet podcast radio network featuring over 50 weekly pet-related talk shows hosted by the most well-known pet experts, authors and radio and TV personalities in the world of animals and pets. Tim Link is an author, writer, speaker, nationally syndicated radio host and animal communicator. Tim hosts Animal Writes on Pet Life Radio. Animal Writes features interviews with best-selling pet-related authors, award-winning writers and journalists that focus on stories about animals and bloggers with interesting topics to share about pets. Each interview gives firsthand knowledge about why the authors and writers chose a particular story, what the featured animals meant to them, and what has become of the animals that they talk about. 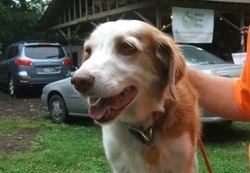 Fidose of Reality, a pet blog by Carol Bryant, speaks of good books to read about dogs (Aug. 9, 2012). 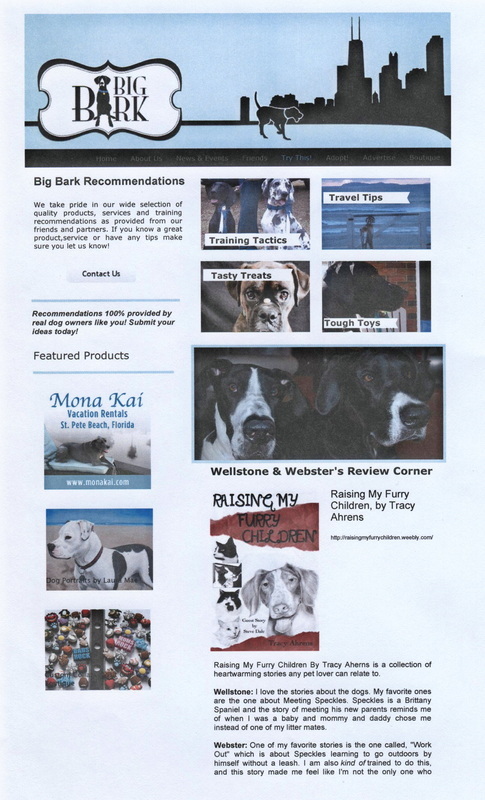 Big Bark posted a review of "Raising My Furry Children" in their December 2012 newsletter. Big Bark, based in Chicago, is run by Andrea Laine Keirn and is "a positive, community driven, small business made up of those who love medium to large dogs - Big Dogs. Our mission is to provide an online resource for every Big Dog question you have. Here we can discuss issues, find products, review services, find your new best friend—and everything else Big Dog." Andrea notes that Big Bark was inspired by her Great Danes Wellstone & Webster. The Danes wrote the book review for "Raising My Furry Children." After January 2013, the review will not be visible on their site, but you can read it here. Download to your desktop for a more readable size. Sue Kottwitz, founder of Talking-Dogs.com posted a review on her website http://www.talking-dogs.com/ about "Raising My Furry Children." The review includes images of my art and a photo of me kissing my dog, Trucker. The review will be archived under the Thursday, November 29, 2012 blog post. Sue promotes her blog posts via Facebook, Twitter, Google+ and Stumbleupon. She is based in Missouri. 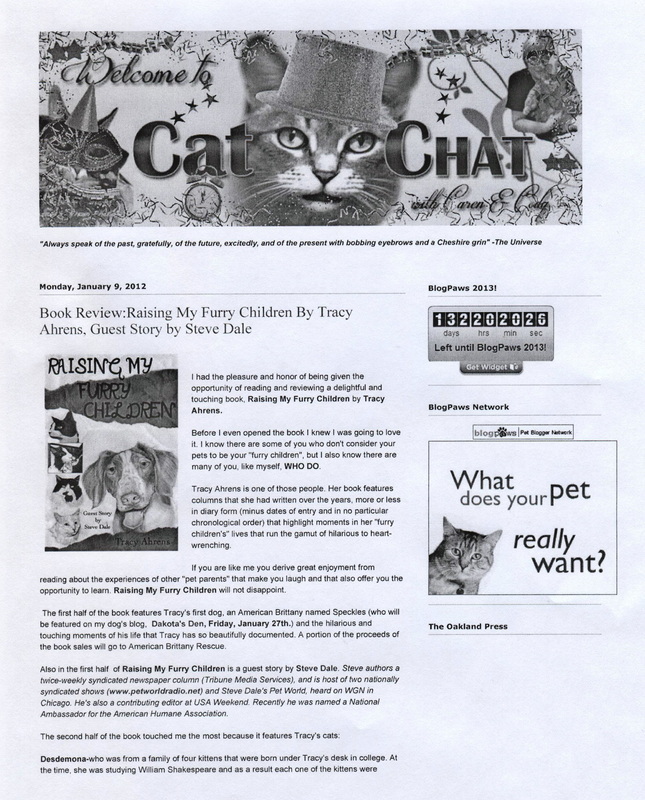 I Love Cats magazine published a review of "Raising My Furry Children" in the Winter/Spring 2013 edition. I Love Cats has a 75,000 readership and their website says that the magazine is available in 3,000 veterinary offices across the country. Their website is www.iluvcats.com. 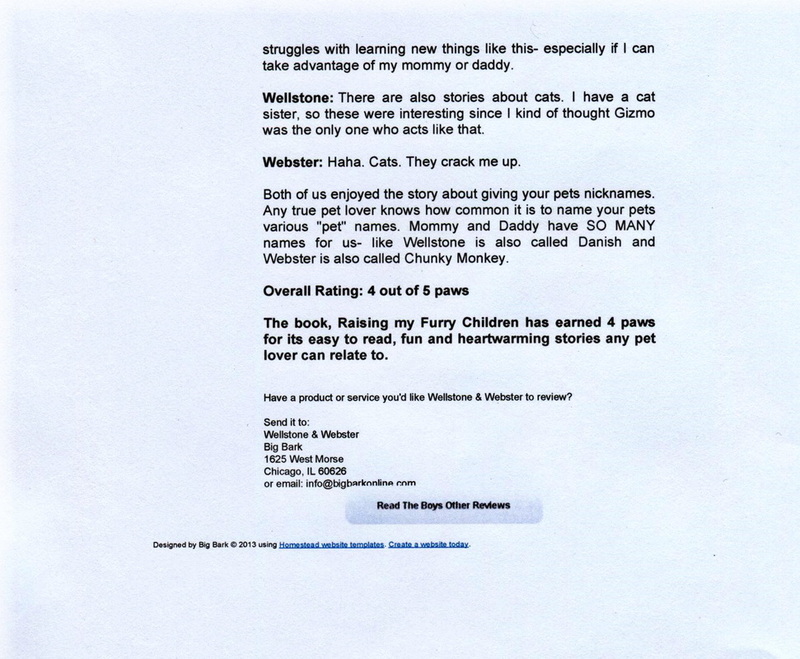 Eureka College, Eureka, Illinois shares notes about "Raising My Furry Children" book reviews in their EC Class Notes newsletter for January 2013. Click here for a view of the newsletter. EC Class Notes. Kankakee and named Uno. He went to a loving home and is now named, Leonardo. Spot Magazine is a monthly publication distributed free at over 800 locations from the Oregon Coast to Mt Hood and the Willamette Valley to SW Washington. Their goal is to provide pet guardians and animal lovers a one-stop resource for information, ideas and events of interest. Issue 1, 2014 of American Pet Magazine. the ezine. My book note is on page 30. My column is on page 36. 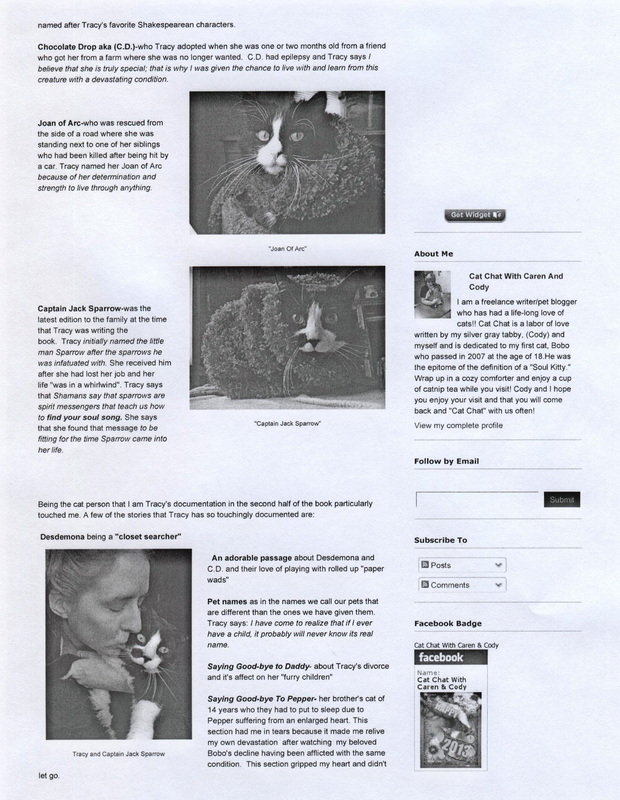 American Pet Magazine publishes an online quarterly ezine. Readers are worldwide. Magazine subject matter is sought from freelancers across the country with the intention of being informative and entertaining. ​Author Deb Barnes included a little story about my cat, Forest, in her new book, "Makin' Biscuits: Weird cat habits and the even weirder habits of the humans who love them" (October 27, 2016). His story starts on page 115. He is spotlighted in a chapter titled "Watering holes and bathroom breaks." You can find her book through Amazon.com or other major booksellers online, or through her website. The Amazon link is below.